10 years. A decade. One-tenth of a century. Whatever way you look at it, it’s an awful long time. Unless you are looking at it in geological time, in which case it’s not even noticeable. Thankfully, neither me nor my blog is a rock. Obviously things have changed a lot during that time. In fact, blogging itself has gone from “You write a what? A “blog”? What the hell is a blog?” (when I started in 2005) to *everyone* is blogging (in maybe 2007 or 2008) to “You write a what? A blog? How antiquated. Can I Instagram a photo of you? #OldLady #GetWithTheTimes”1. I obviously don’t blog anywhere near as often as I used to – the days of the 231-day blogging streaks are over2. Even at my peak, I never had a tonne of comments on my blog postings, but the comments section has been a veritable wasteland for years now, with the few people who choose to comment doing so on the Facebook posting linked to my blog posting. Blogging is hard because writing is hard. Writing is hard because finding the time to do real critical thinking and then to put those thoughts down in writing is even more complex. Reading, research, critical thinking, writing, editing and publishing isn’t like posting a picture to tumblr or texting off a tweet. They’re different beasts and they deserve different forms of metrics and comparison. When I used to not have those other outlets, I channeled all of my creative energies into blog postings. Now it’s much easier to post a funny one liner on Twitter and go on about my day. But the thing is, I’m still constantly thinking of ideas that would take more than 140 characters to write, and I often find myself making a mental note about something that I want to blog about3. I currently have 63 draft postings sitting in my blog in various states of being written (from just a title to remind me of something I wanted to blog about to some half-baked postings that I haven’t found the time to finish baking), not to mention other ideas jotted on my whiteboard and still others floating around in my brain. But, as Joel says, finding the time to actually craft a blog posting is the real challenge. It’s not just that other social media platforms are competing with blogs, it’s that all the other stuff I do in my life is competing for my time. Anyway, after all this talk about needing to spend time to think critically to write blog postings, I’m pretty much just rambling on at this point. So I should probably find some way to wrap this thing up. But now I can’t think of a good ending. Gah! The pressure is too much. Oh wait, I know! How about a quiz to see if anyone is actually reading this. 1000 points to anyone who actually posts a comment on this blog posting (and you lose one million points if you post a comment on the link to this blog posting that appears on my Facebook). Omg, why didn’t anyone make this cake for me today? -Number 10 image osted by draml on Flickr with a Creative Commons license4. 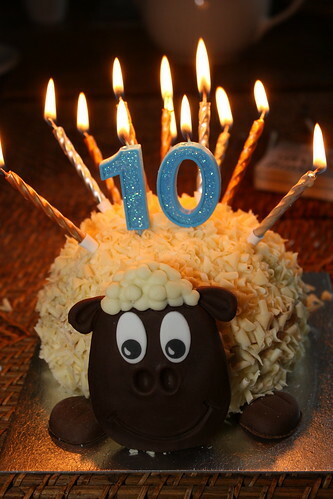 -Sheep cake photo posted by darkdwarf on Flickr with a Creative Commons license. 12 Responses to Happy 10th Blogiversary to Me! Thanks! And 1000 points to you, Michelle. Don’t spend them all in one place! I read your blog in feedly! It makes me miss you but also makes me happy! I agree 100% with all your pet peeves and want to add one…. People who say “on a scale of 1 to 10 I’m a 12.” You just self defined the scale parameters!!! I’m glad you still blog, because half of the blogs I used to read no longer exist. I enjoy reading what you’re doing. Happy blogiversary! Happy anniversary! Yay blogging! I get 1000 points. Happy blogiversary!! I love that you blog, it’s awesome to hear what is going on in your life and what’s making you tick. Thanks, guys! 1000 points to all of you! @Jen – I miss you too! I don’t think I’ve walked around the Stanley Park seawall even one time since you left. I miss our Saturday morning walks! What Stacey and Erika said – I mostly like that I can keep current with you even when we’re both too busy to connect in real life. I have been enjoying your current blogging streak. 🙂 Happy Blogiversary!